Super Eagles midfielder, Ogenyi Onazi said the Eagles will be in a good frame of mind to confront England on June 2 as the match and others lined up for the national team will boost their confidence for the World Cup starting June 16. 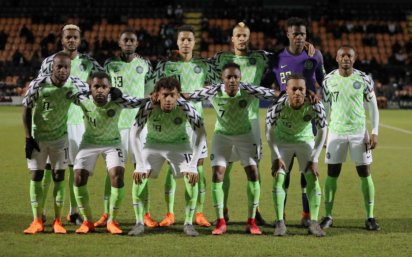 Nigeria host the Leopards of DR Congo in Port Harcourt on 28th May, before a prestige clash with England’s Three Lions at Wembley Stadium in London on 2nd June and an encounter with the Czech Republic in Vienna on 6th June. “We are not focusing on any particular game; we are getting ready to face all the teams that we have to play before the World Cup. It is the right mentality to approach the games. “I have been asked several questions about the match against England, but I tell people that the England match is very important, just like the other matches that we have to play. What is key for us is to get into the right psychological state to confront every opposition that lie ahead, including those that will be waiting at the FIFA World Cup,” Onazi told thenff.com on phone from his base in Turkey. He said the players remain humble despite their victory over Argentina and Poland in previous friendlies. “For us, humility and hard work will be the winning words going ahead. Our preparation is going on well and we are happy with that. At the World Cup, we will come up against different teams with different styles and approaches of play. It is important that we are adequately prepared and we appreciate the games that the NFF has lined up for us,” said the Trabzonspor of Turkey ace.